Alphalite LED High & Low Bay - Contact Us Today for Inquiries! The High Performance LED High-Bay and Low-Bay delivers high lumen output, long life, dimming capabilities, and no restrike time. This energy-efficient LED luminaire offers one-to-one replacement of existing HID or fluorescent high bays. Quality manufactured die cast body integrated with high performance components enables long life and lower maintenance costs. APPLICATION Warehouse, manufacturing facilities, retail, gymnasiums, grocery. 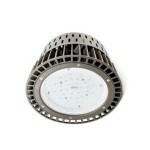 The Slim Round LED High Bay delivers high lumen output, long life, economic solution, and no restrike time. This energy-efficient LED luminaire offers one-to-one replacement of existing HID or fluorescent high bays. Precision-formed reflectors delivers adequate light in high mounting applications. Modular driver and LED arrays. Economic solution to optimize payback. Capable of being operated with occupancy sensor.